You will find your rabbit will have his or her own likes and dislikes when it comes to different foods. Like people, rabbits are capable of “pigging out” on treats that fail to provide good nutrition or those which may upset the intestinal tract. Use common sense about what and how much you feed your rabbit. Remember that rabbits are vegetarians with limited or no ability to digest milk products, meats, etc. Think of rabbit treats as candy is to a child and limit them accordingly. Keep in mind that a sudden overload of starches and/or sugar in the hindgut can upset your rabbit’s digestion. That cute little whiskered face is so hard to ignore, especially when your bun sits up and looks so deserving of that special treat. And pet stores sell a selection of rabbit treats that are perfect for your precious rabbit. Right? WRONG!!! Most so-called rabbit treats are the equivalent of taking your rabbit to McDonald’s, providing non-nutritious junk that can cause potential harm to your rabbit. Confusing the issue is that many of these products use phrases that lead the buyer to believe that the product is healthful: “nutritionally fortified,” “doing right for the environment,” “natural feeding habits,” “for nutritional variety,” “the finest selected ingredients.” The addition of “feeding instructions” and “guaranteed analysis” lend a cache of authority. Commercial rabbit treats fall into several categories: pellets, processed cereal kibble, mueslix (dried seed/fruit/veggie mixes), cereal/veggie blends, and candies/sugars. None offer an advantage over the fresh vegetable, high fiber pellets, and unlimited hay diet. Pellets …..Chose a pellet that is high in fiber (20-25%), low in protein (14-15%), and low in calcium (<1.0%). Restrict pellet feedings to age recommended guidelines and feed plenty of fresh vegetables and unlimited hay. Don’t buy a pellet that contains seeds, nuts, or starch-rich cereal kibble mixed in (see below). Processed Cereal Kibble…..These range from “Crunchy Puffs” to shaped products designed to substitute for pellets. Some contain expensive extras such as plant or herbal extracts and freeze dried bacteria that serve no benefit to your rabbit. One contains less than the National Research Council (NRC) requirements for calcium. Another contains cheese flavoring! Supplementation with digestive enzymes (proteases, amylases) normally is unnecessary because these foods are highly digestible and because there is no evidence that healthy rabbits produce insufficient levels of these enzymes. In fact, some of the most important digestion is by the cecal bacteria. These kibbles tend to be lower in fiber and higher in fat. They’re also extremely expensive and come with feeding recommendations destined to cause obesity in a spayed or neutered house rabbit. 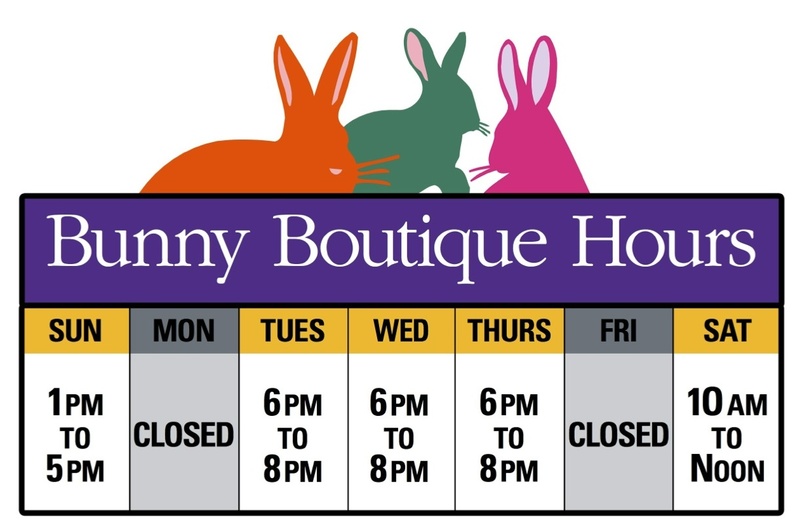 The variety of colors and shapes are more aesthetic to the human buyer than to your rabbit. Again, fresh vegetables, restricted high fiber pellets, and unlimited hay are healthier and easier on your budget. Mueslix….. These are mixes which are made of seeds and grains. They’re marketed as “vitamin and mineral enriched,” a “delicious energy provider,” or “fortified.” They’re made of carbohydrate and fat-rich seeds and grains such as oats, milo, corn, peas, sunflower seeds, potatoes, peanuts, puffed corn, cornflakes, popcorn, and dried fruits. They’re often held together into “sticks” with honey and other sugars, and are marketed with the explanation that they supply needed energy and reflect the rabbit’s normal diet. In reality, a diet of vegetables, hay, and restricted pellets provides all the nutrients and energy your house rabbit needs. Seeds are high in fat and are important for wintering animals. Your house rabbit has no such need. In fact, the National Research Council recommends domestic rabbits receive no more than 1.5% of their calories as fat. Labels on the back of these mueslix products list a minimum fat content of 4-5% – the real value is probably greater. Rabbit metabolism is geared for a low fat diet. In comparison, the average human diet contains 35-40% fat and the excess is not burned but is stored as body fat. Rabbits appear to be more sensitive to fat than are humans. In addition to obesity, excess fat can accumulate in your rabbit’s liver and arteries (arteriosclerosis). Veterinarians have reported that rabbits fed seed-rich diets have a much higher incidence of fatty liver disease (hepatic lipidosis), which is often fatal. These seeds and grains are also rich in starches. While some of this starch is digested in the small intestine, much of it is not accessible until it reaches the cecum. There it becomes a potent energy form for the cecal bacteria. Unlike cellulose fiber, which slows fermentation, starch in the cecum is fermented rapidly and can lead to bacterial overgrowth, bloat, and GI stasis. Cereal/Veggie Blends…..These are grain products that may be supplemented with dehydrated vegetables and shaped into a form that mimics a vegetable product. There is no advantage to feeding these over the real vegetable. One product label lists three different cereals before the dehydrated vegetable! The high carbohydrate content of these snacks means they are robbing your rabbit of important fiber and overloading him with sugars. These products also tout the vitamins that are added back due to processing. Real vegetables will supply as much if not more. Candies/Sugar…..These can include everything from yogurt drops to sweetened papaya tablets*. High sugar is the culprit here. Many rabbits have a sweet tooth, but sweetness means a high content of sugars. As we discussed above, excessive sugar is converted to fat or will pass into the cecum where the bacteria will use it for energy and then rapidly overgrow, possibly leading to bacterial imbalance and GI stasis. The same can occur after feeding too much fruit. Avoid feeding your rabbit simple sugars and instead stick with nutritious treats such as vegetables and herbs. Save the sweets for an occasional raisin or banana snack. Vitamin Supplements…..These are largely unnecessary. For nearly all rabbits, a diet containing a variety of fresh vegetables, restricted high quality pellets, and unlimited hay provides all the vitamins your rabbit requires. Many of your rabbit’s vitamins also come from her normal ingestion of cecal pellets. While special health situations may require nutrient supplements, these are best handled after consultation with your veterinarian. 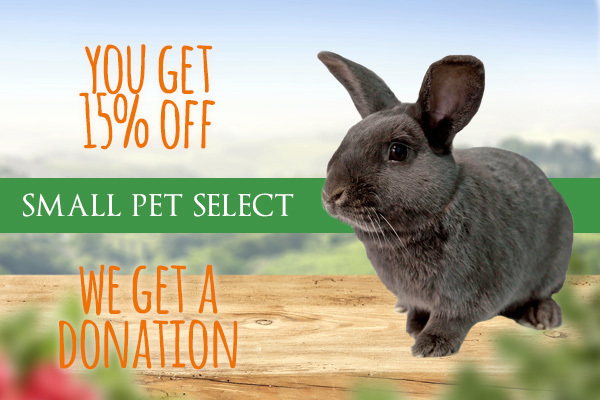 It’s tempting to show your love for your rabbit by purchasing treats for her. If you’re in doubt, read the ingredient label. Pay particular attention to the list of ingredients (they’re listed in order of abundance) and the percentage of fiber and fat. Speaking as a nutritionist, my best advice is to save your money and show your love with healthy treats like vegetables, hay, and untreated wood for chewing. And give plenty of pets, which are of course free. By Susan M. Smith, Ph.D.